Stories on Instagram is one of the most popular feature of the app. It copied the feature from Snapchat but beat it in its own game. Now the company has added several options to make stories interesting. You can share different kinds of posts on Stories and share your day with friends. This is what makes Stories feature interesting. You can experiment with different kinds of posts and see what your followers like the most. The story you share on Instagram remains active for next 24 hours. You can also manually delete it if you want to stop showing a story on your profile. Instagram is actively adding new features to make Stories feature interesting. Instagram team is really active recently they added GIF stickers for Instagram stories and also added Polls on Stories few months back. So, you can ask people to vote on something and get their response. Now they have added text stories. It is also rumoured to add video calling option as well. I have already wrote several how to articles on Instagram. Do not miss those after reading how to add text stories. Also see: How to watch Instagram Stories Anonymously. Instagram has finally added the option to add text only story. So, you can now type any text and add it as Instagram Story. Before this official update, I used to created photos with plain backgrounds and text on it. But the new update has made it really easy. Now it is easier for me to share just text updates and I do not need to edit a text only image. 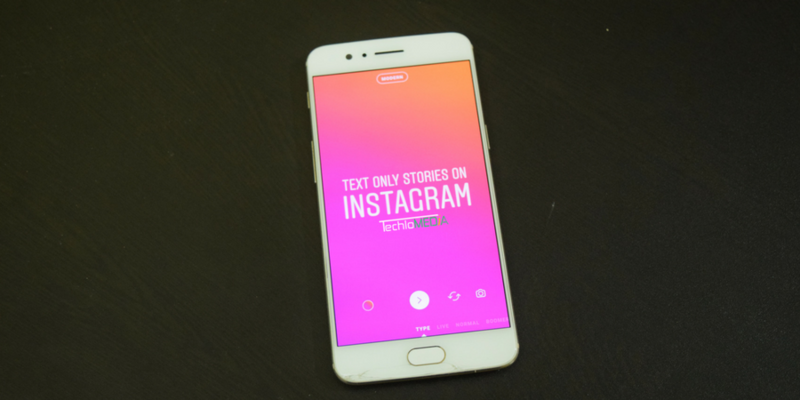 If you are not sure how to do this, you should keep reading this article and know how to add Text only stories on Instagram. I have a step wise guide to share text stories. I am trying to keep it as simple as possible. Here are the steps to add text only Stories on Instagram. Follow these steps and you will know how to do this. To add Text stories, open the Instagram app and swipe from left to right to open the camera. Now find the Type option located below the camera. It will be the first icon just before the Live option. By default it opens the camera option. So that you can capture a photo and share it as a Story. Now you see a screen saying “Tap to Type”. Start typing the text you want to add as text story. When you are done, you can think of changing the background and text style, At the top, you will also see a text ‘Modern’ with line border. Tap on this to change the text style. Tap again to change it again. For now, you have limited text styles but the company will surely add more in coming weeks. You will also see the colourful circle at the bottom left side. See the second snapshot above. Tap on it to change the background color. Keep tapping to explore all background colors. It will change the background colors in repeat mode. It also offers limited options but the company will surely add more in coming weeks. When you are done with your selection of text style and background, you can publish this story. It will be available for your followers for next 24 hours. Like other Stories post, you also have an option to delete this as well when you want. If you posted something wrong, you can always delete it and post a new Story with correction. Now you know how to post text only Story on Instagram. Instagram will surely add more text and color options along with other background options to make Instagram stories interesting. You can try text stories when you have no photo to share but have something in your mind. Steps to add text only stories on Instagram and straightforward. There is nothing you can find hard. It is similar to sharing any other kinds of stories. Instagram just added a new option that you could miss. If you regularly use Instagram stories, you can try text only stories as well. Text stories will surely increase number of people using Instagram stories. People who found it hard to capture and share something can also try to write something and share. I personally capture less photos but sharing text stories will be something I will surely try. You can follow me on Instagram @deepanker70. I usually posts snaps I capture from different smartphones I review. UseThisTip is not on Instagram but you can follow @thetechlomedia where I share lots of tech updates that you will surely find interesting. That Instagram handle belongs to my Tech News and gadget related blog Techlomedia. I also share my moments there. You can also share your Instagram handle in comments and let others know why they can follow you. Instagram Stories are getting popularity. It is also a good option for marketers. So, do not miss this opportunity. I have already written an article on increasing Instagram followers and popular hashtags on Instagram for better reach. Instagram influencers with good number of followers earn good amount. I have also written how to earn good money on Instagram. you can also read that article if you have good number of followers. Instagram also allows to hide photos without deleting. That is also an interesting article to read. We have lots of Instagram tips and tutorials. If you are active on Instagram, You should not miss those awesome articles. What do you think about this? Let us know your views in the comments. If you have anything specific to ask about Instagram or any other app, you can always ask. If you find this article Interesting, do not forget to share it with your friends. Follow us on different social media accounts to get timely updates.